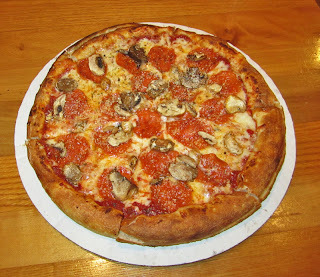 After my last visit to RedBrick Pizza in Sanford, I wrote that I would probably not go back because I was underwhelmed. But I went back to give them a second try after getting an email telling me they were under new management and a similar comment on my previous blog post. So, almost two years to the day later, we once again ventured to RedBrick Pizza to give them a second try. It was later in the evening, past 7 PM on a Saturday evening, and we were in search of a light bite to eat. The place was not very busy when we entered, maybe three or so tables occupied. But we were promptly greeted and our order promptly taken. Also, it arrived rather quickly. 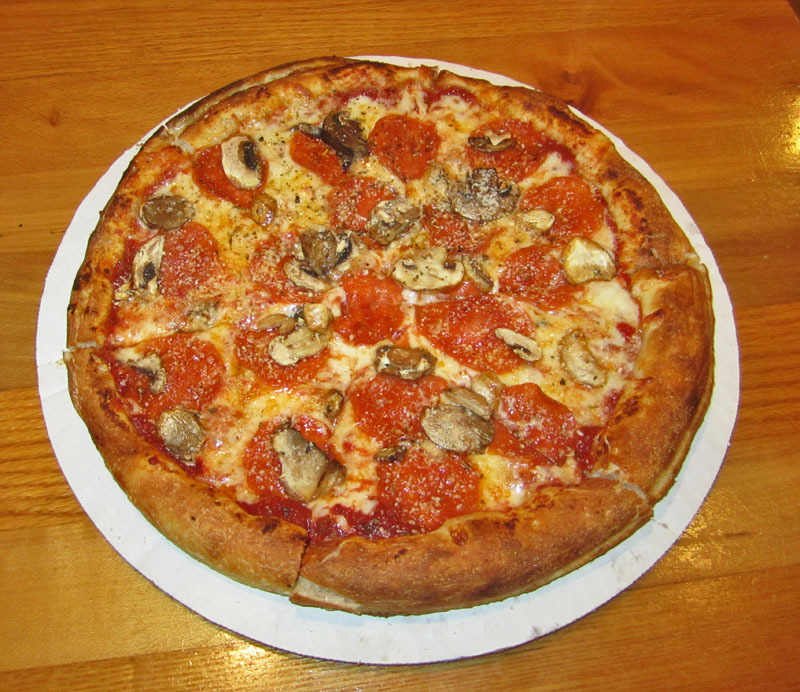 We'd barely uttered the words "medium pepperoni with mushrooms" when we saw our pizza being made. So, the service was friendly, the restaurant was clean, and the food arrived promptly and nice and hot. Our pepperoni and mushroom pizza was OK, but just OK. I guess the first thing that confused me was how the pizza dough was made. RedBrick says they are "gourmet" pizza, but they use a machine to press out the dough into a nice, neat, round with a nice, neat, precise raised edge. The dough was just OK, nothing really set it apart, and I think a hand pressed/made crust is far superior to a machine made crust. The sauce and cheese and toppings were good and the pizza was cooked properly. So it was a good pizza. But just not a great pizza. It was served hot and fresh and fast and for the just-over $11 price, not too bad, but it just did not strike me as gourmet. However, if I was looking to have a decent pizza cooked properly and served fast, I would come back. Still, the experience was not enough to convince me to change my urbanspoon.com vote, sorry. It was OK, but there is much better pizza in the area. Of course, those places (like Caffe Positano and Terra Mia) are usually much more busy and much harder to get into, but there's a reason for that. And a reason that RedBrick was so not-busy on a Saturday evening. 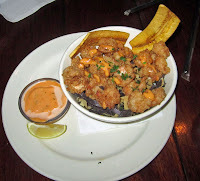 My friend Tommy and I went to Bahama Breeze Island Grille in Altamonte Spring for dinner on a recent Friday evening. I knew we'd have to wait, and sure enough there was a 45-60 minute wait. But it was a pleasant evening and we found a nice spot on the large patio and had a few drinks while we were waiting. Eventually we were seated and we started off with the Firecracker Shrimp appetizer. This was pretty gosh darned good, though not the best I've had, buttermilk battered shrimp that were deep fried and served with a fiery, creamy red pepper remoulade. Still, I'd have it again. The shrimp could have been cooked just a half minute less, but they were not way overdone either. The remoulade was great and a nice accompaniment. I liked this dish a lot. For his meal, Tommy decided on soup and another appetizer. For the soup he had the Bahamian Seafood Chowder. 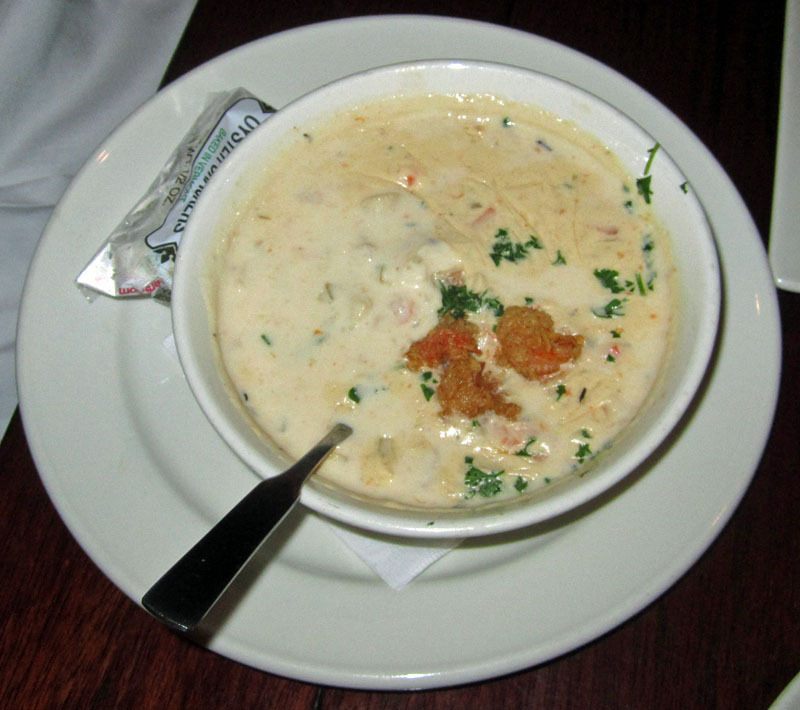 The soup had a cream base and contained shellfish and vegetables, and was topped with a few fried shrimp. It was very good. I know, because I had a taste. Then he had the Chicken Empanadas. They were the normal fried pastries with an adobo seasoned chicken filling that also had with mushrooms, sweet peppers and onion. Ut was served with a seasoned sour cream and black bean roasted corn and fresh tomato salsa on the side. 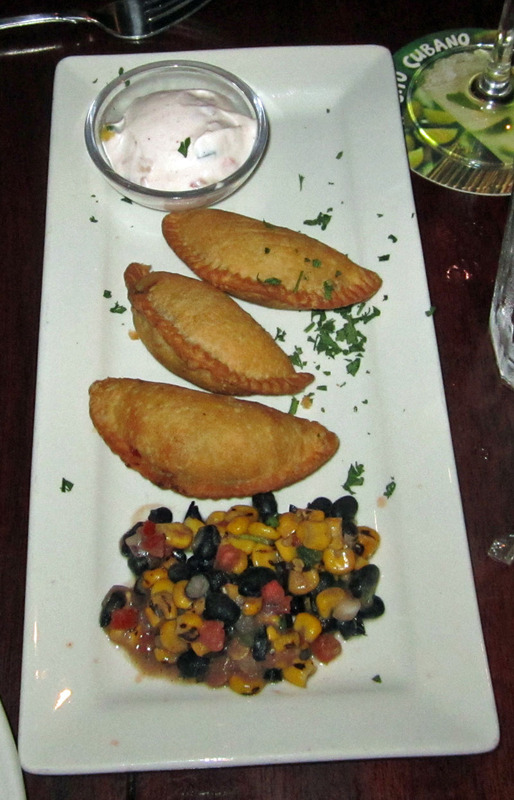 The empanadas were good and the salsa was very good, it had a nice and bright flavor. Another hit! 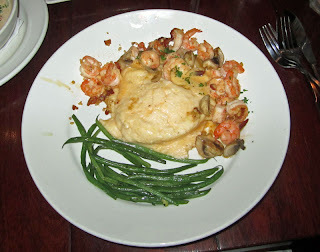 For my main course, I had one of my favorite dishes, one I've eaten at a number of restaurants, Shrimp and Grits. It was good, though not great. The shrimp were cooked pretty well, but again, maybe 15-30 seconds overcooked. However, they were not way beyond cooked and so were not at all rubbery, something I abhor. The grits were good enough though just a bit clumpy and not quite as creamy as they should have been. I think they could have suffered a bit of stirring and a few more drops of cream before being served, then they'd have been nice and creamy. The accompanying green beans were very lightly steamed and were good. Overall, this was pretty good, though nothing set it above some of the other shrimp n grits meals I've had. Our experience here was pretty good. Our server, Amber, was attentive and helpful. We enjoyed the meal and the prices seemed about right for what we got. 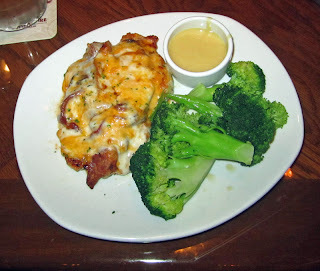 We had a very nice dinner recently at the Outback Steakhouse in Sanford. We started with drink. 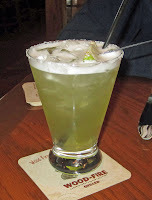 I had a beer but my friend Tommy had the Margarita. He said it was absolutely delicious. After a long, hard day of work, I'm sure it was. We started with the Grilled Shrimp on the Barbie and they were wonderful. We had them wood-grilled and the flavor and aroma of the wood was apparent. And, they were cooked right, just done, not overcooked. They were lightly seasoned and accompanied by a remoulade sauces that was fantastic. For my main course I had the Alice Springs Chicken, a wood-fire grilled chicken breast topped with sauteed mushrooms, crisp bacon, monterey and cheddar cheese, and finished with a honey mustard sauce. I had my accompanied by broccoli. The meal was delcious. The chicken was nice and tender, and the broccoli was just lightly steamed. I love mine with a bit of lemon juice. It was a very good meal, I enjoyed it. My friend Tommy had the Outback Special, a 6 oz. sirloin filet that was grilled on the wood-fired grill. It was accompanied by a loaded baked potato. 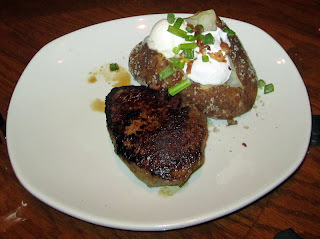 I had a taste of the steak and it was indeed delicious, cooked just as ordered, tender and juicy, with a nice wood-grill flavor and aroma. There is a reason that we keep going back to Outback time after time, and that is consistency. Their food is always consistently good. I've have some of the best shrimp ever at Outback (unfortunately, that item, the Shrimp on the Barbie, is no longer on the menu--dang!). But whatever I've had there, it's always good, the service is always good, and the meal is a fair value for the price. I guess I'll keep going back! Wow! My friend Tommy brought home a sandwich from Tuesto Café today and it was mighty fine. The sandwich we had was a the Pulled Roast Pork sandwich. The pork was roasted very well, tender and juicy. 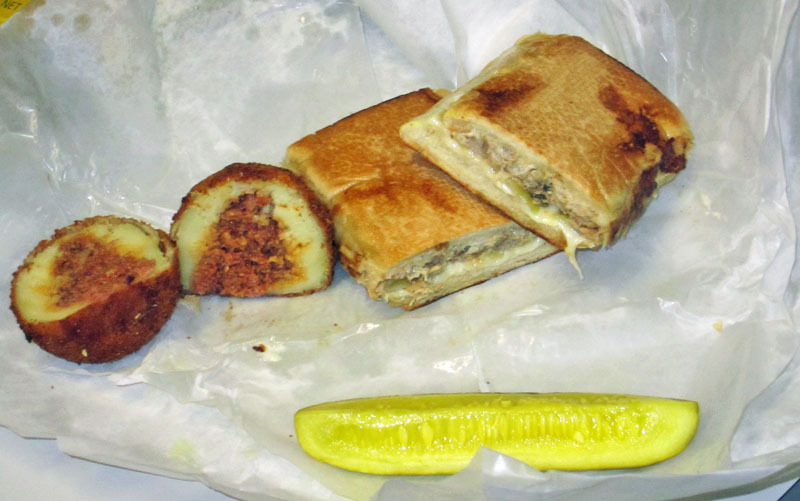 It was served on a Cuban type roll with swiss cheese, onions, mayo, and mojo sauce. It was an excellent sandwich. The pork was so tender and juicy, it was amazing. There was not a lot of other seasoning and that allowed the flavor of the pork to shine through. Nice job. Along with that we had the Potato Ball. A round ball of potatoes was stuffed with a delicious ground beef filling, then breaded and deep fried. It was delicious! Based on this experience, I'd certainly go back--again and a gain. It could be a very addicting place and a great lunch or "quick bite" place. Willow Tree Café was featured on My Fox Orlando recently. You can see the segment here. Octoberfest starts tonight, Thursday October 13th, at Willow Tree Cafe as a part of the monthly Alive After Five event. As always, I'll be hanging out much of the time at Art Affair Gallery. Join us! A pierog (single, one) is a little dumpling that is filled with a filing and usually boiled, then fried, and served with some accompaniments. In Polish, "pierog" refers to one, singular, and "pierogi" refers to more than one, plural. So, the word "pierogi" is already a plural word and adding an "es" to it is not correct. Worse yet, the forgot the first "i"... it's Pierogi, not perogi--that is not a Polish word with any meaning. But, on to the pierogi (there were three of them, so plural, and now spelled correctly). The actual pierogi themselves were just OK, but the way they were served deserves comment and accolade. The pierogi appeared to be very average, maybe even the "Mrs. T's" store brand (hint, guys, buy them at the Europol store on Aloma and 436--they are much better there). They were boiled and then fried, very traditional. But then they were topped with a very delicious sour creme sauce and sprinkled with some fried bacon. 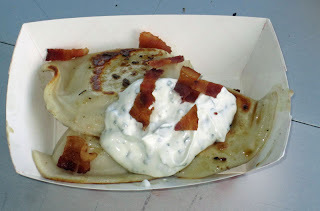 I'd guess the sour creme sauce had some yogurt in it as well as chives and dill, but it was sure delicious and really made up for the pierogi's somewhat bland filling. I'd probably eat these again, but if they really use quality pierogi--and I could show them how to make some excellent pierogi--they'd have a real hit on their hands. And then the dessert. The picture here does not does it justice. 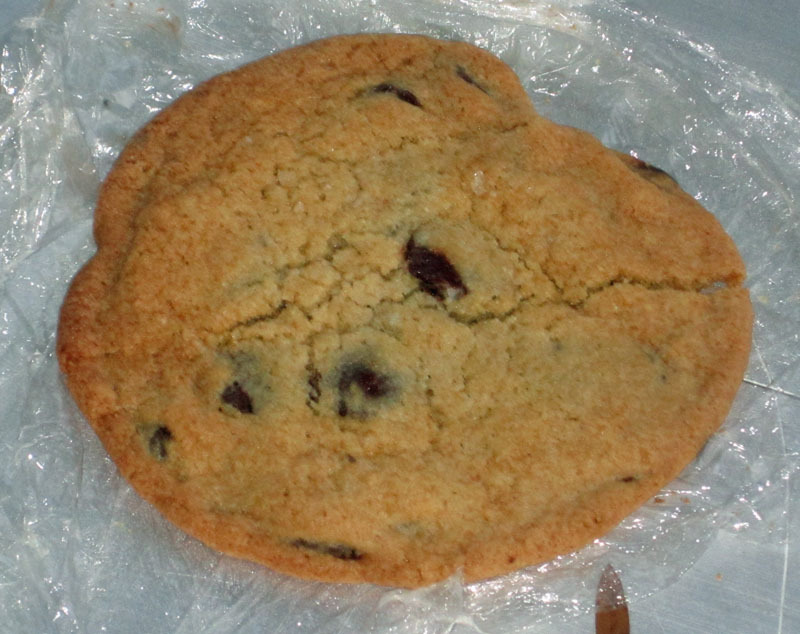 This cookie was at least 6 inches across and nicely cooked, nice and moist and tender. It was a Sea Salt Chocolate Chip Cookie, and at $2, it as a steal! Moist, tender, with a hint of salt and some nice chunks of chocolate, this was a very good cookie and we both enjoyed it. 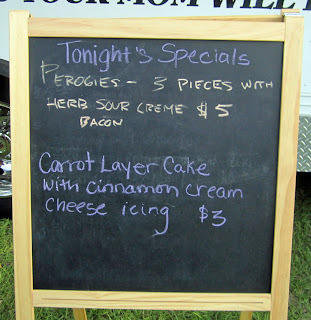 We really enjoyed our time at the Apopka Food Truck Roundup, and that was in part due to the good food (bad spelling notwithstanding) at the Treehouse Truck. If you want to know where they'll be next, you can friend and follow them on Facebook. 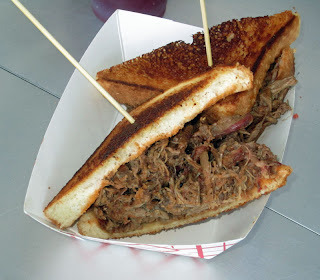 We ate some decent sandwiches at the C&S Brisket Bus at the Apopka Food truck Roundup on the first Thursday of October. 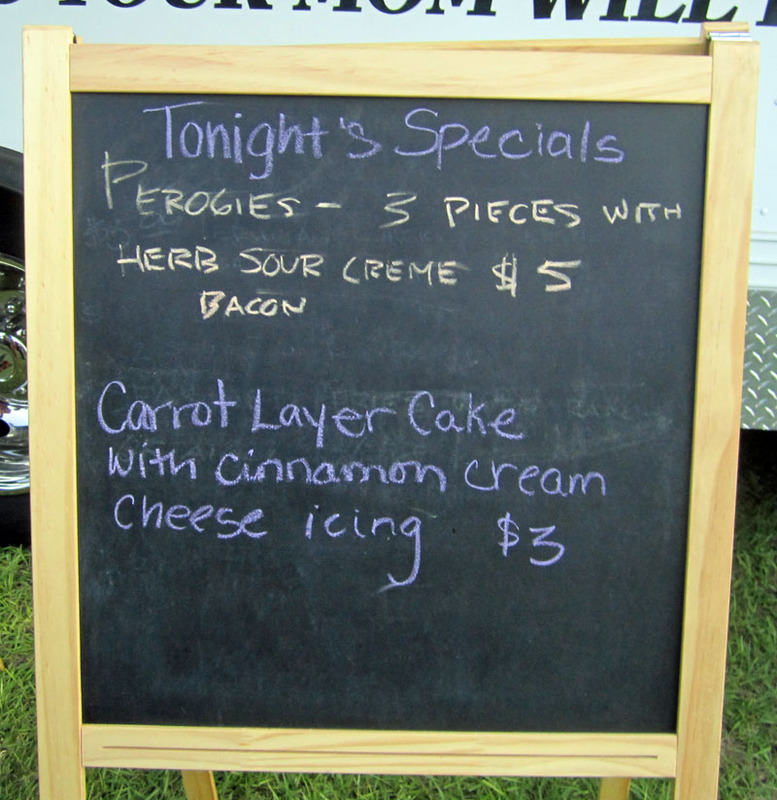 The event started recently and is held every first Thursday in at Kit Land Nelson Park in Apopka. After looking over the various offereings of the 14 trucks in attendance, we decided to give C&S Brisket Bus's food a try. It was good. I had the Texas Brisket, smoked sliced brisket covered with a sweet and sour barbecue sauce and served sandwich style on Texas Toast. At $9 for a whole and $6 for a half, the choice was a no-brainer. I had the whole and then split it with my friend Tommy. The brisket was nicely smoke and the barbecue sauce did somewhat remind me of Texas BBQ, though maybe from far east Texas, as close to Tennessee and the Carolias as you can get, due to the bit of tang from the vinegar. Yet, it was very good. The Texas toast was the perfect vehicle for this hearty sandwich. 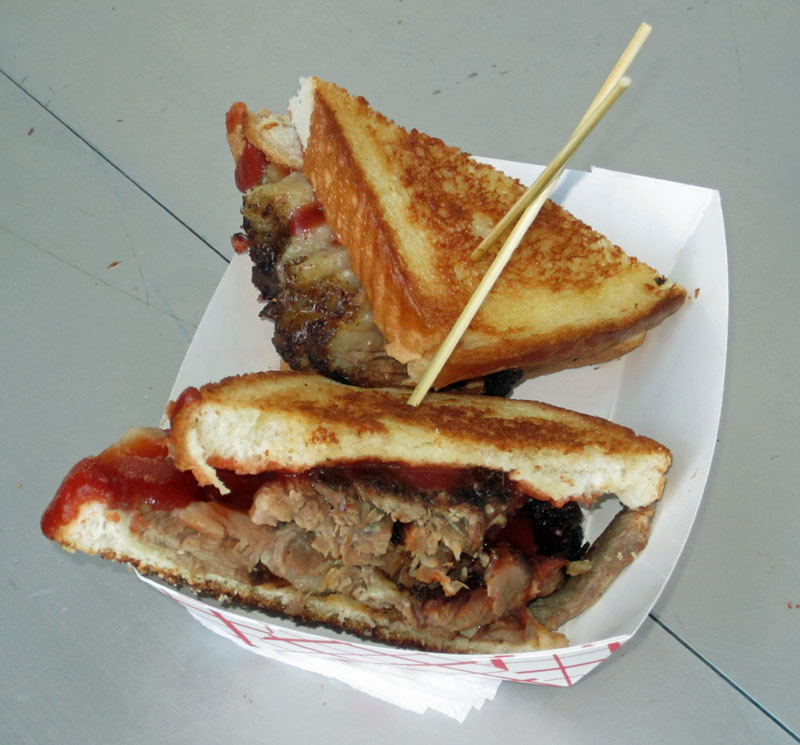 My friend Tommy had the Carolina Pulled Brisket Sandwich, grilled smoked brisket that was mixed with an eastern North Carolina type vinegar based barbecue sauce and served on grilled white bread. It was the same price, so again, a no-brainer, we each ended up with half. This was a very good sandwich and I'd say I liked it marginally better than the Texas sandwich. Still, they were both very good. If anything could be said for either sandwich as a criticism, I'd say just a tad more sauce would be in order, to really highlight the BBQ flavor. But overall, a nice job, we liked this. Now to try some of their other items another time. And I will be back, for sure. If you'd like to know where this Food Truck is, friend them on Facebook!